1 Route 43 Harley-Davidson Sheboygan, Wisconsin. Manufacturer of stock and custom packaging solutions for business. Manufactures one and two piece folding gift and apparel boxes and folders. Copywriting, editing, communication planning, marketing, and quality assurance. Sheboygan, WI. A small hobby farm. Includes information about their herds. Located in Sheboygan Falls, WI. Manufacturer of components for store fixtures, displays, and garage and home organization. Based in Sheboygan Falls, Wisconsin. Kohler, Plymouth, Howards Grove and Sheboygan. Offers graphic design, business cards, letterheads, and stationery. Sheboygan, Wi. Metal stampings, stamped metal assemblies, and molded thermoset composite parts with advanced engineering, tool and die, and powder coating capabilities. Sheboygan WI, Pikeville TN. A fixed base operator renting Cessna aircraft along with instruction, inspection and maintenance services. Based in Sheboygan Falls. Also includes listings of aircraft for sale. Provides business and personal banking and lending services for Howards Grove and Sheboygan, WI. Offering medical savings accounts and MSA debit cards nationwide, lending and mortgage services for Howards Grove and Sheboygan. Manufacturer of brackets, bands, buccal tubes, wires, instruments, elastics, bonding materials, ligating materials, specialty products instruments. Based in Sheboygan, WI. Full body puppets. Based in Sheboygan, Wisconsin. New and used parts for vintage Japanese motorcycles. Includes ready-to-ride and project bikes for sale. Honda, Yamaha, Kawasaki. Located in Sheboygan, Wisconsin. 16 Johnsonville Sausage Sheboygan, Wisconsin. Sheboygan, Wisconsin. Bratwurst, chorizo, beef franks, wieners, Italian sausage, ring bologna, and breakfast sausage. Offers bratwurst, summer sausage, kranski Slovenian sausage, bacon, ham, and meat snack sticks. Sheboygan, Wisconsin. 18 Old Wisconsin Sausage Sheboygan, Wisconsin. Sheboygan, Wisconsin. Offers bratwurst, Polish sausage, wieners, ring bologna, meat snacks, and summer sausage. Providing comprehensive orthopedic and sports medicine care. Offices located in Sheboygan, Chilton, and Plymouth Wisconsin. An open membership model railroad club in Sheboygan, WI whose group focus is on HO and HOn3 scale models. List of awards they have won and contact information for breeder in Sheboygan, Wisconsin. PADI 5 Star facility in Sheboygan. Equipment, classes, travel and activities. Non-profit organisation offering all levels of obedience and agility, with explanation of classes and competition requirements. Includes events schedule and map. This AKC club sponsors an annual Conformation and Obedience show in Wisconsin. Non-profit organization offering dog obedience and agility training. Includes events schedule and map. Stands sorrel overo and chestnut tovero stallions at stud. Includes sales list, photos, and profiles of horses. Located in Sheboygan Falls. 27 Hole golf Course located in the southeast part of the state. Located within 1 hour of Milwaukee and Green Bay. Offers hall rental for birthday and wedding events, photos and a calendar of skating events. Located in Sheboygan. Located in Plymouth, this 1/3 mile, semi banked, clay oval races Winged Super Modifieds, Limited Late Models and Super Stock classes. 31 Blue Knights Law Enforcement Motorcycle Club: Wisconsin IV Chapter Sheboygan area. Sheboygan area. Open to all active and retired law enforcement officers who ride motorcycles. A fraternal and social family oriented organization. This AKC club sponsors an annual Conformation and Obedience show in Wisconsin. Site includes show and membership and training information. 38 Sheboygan Church of Christ Sheboygan, Wisconsin. Projects, membership and contact information. Includes member biographies, news, lyrics, and photographs. Sheboygan, Wisconsin. Information on Brat(wurst) Days, haunted house and golf tournament. A haunted attraction presented by the Jaycees. Located in Sheboygan. Contains pictures and special promotions. Includes a weekly bulletin, calendar and schedule, youth and adult Christian formation, and an explanation of the Anglican Rosary. Hours of operation, pictures of available pets, adoption form, volunteer needs, and information on their spay / neuter assistance program. Includes Worship schedule, calendar, mission statement, location with map, and contacts. SiteBook Sheboygan City Portrait of Sheboygan in Wisconsin. 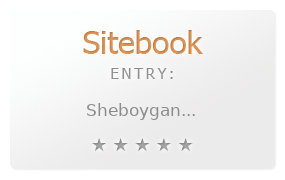 This Topic site Sheboygan got a rating of 4 SiteBook.org Points according to the views of this profile site.